Murphy says: “Anything that can go wrong, will go wrong”. When it happens to your store it’s best to get the information about it ASAP and present the error in the most humane possible way. Let’s do it! Since ever Magento presented it’s errors on the front-end for everyone to see and it was good for the developers but once the site has gone live that couldn’t be an option anymore. In Magento 1.4 those errors are now hidden and all your customer could get about the actual error was the “error number”. Good for the developer since they could just look up the error in log file but the customer that ran into that error isn’t pleased since he or she got some techie message and what’s more interesting in the magento’s default theme. Not good. I’ll try to describe the steps on how to make your site both developer and customer friendly without breaking the integrity of your store. Also, we’ll set up an email to be sent to the desired e-mail address when such error(s) occur so that you can react on time. Note: This applies to Magento 1.4 and above! These steps involve editing some xml files and I’ll be as clear as possible so that you can do it yourself in no time. Go to your root magento installation folder and locate /errors folder. There you’ll find a local.sample.xml or sample.local.xml and rename it to local.xml. Duplicate the default folder inside /errors folder and rename it to match the name of your theme you’re using for the site. We’ll use this folder to style the error page according to the site’s theme. All you have to do is to replace the css file and related images from your error theme with the ones from your theme’s folder. This will ensure that the “error page” looks the same as the rest of the site. Neat. As you can see from the image everything is actually explained in the comments so you can reference those when changing the values. <action> -> if the tag is empty, enter “email” to enable sending the notification of the error via email and of the errors will be written inside /var/report folder instead of displaying on the front-end if you used the “print” inside tag. <email> -> Enter the email you want to send the error report notification to. Oh, yes… Some images please. 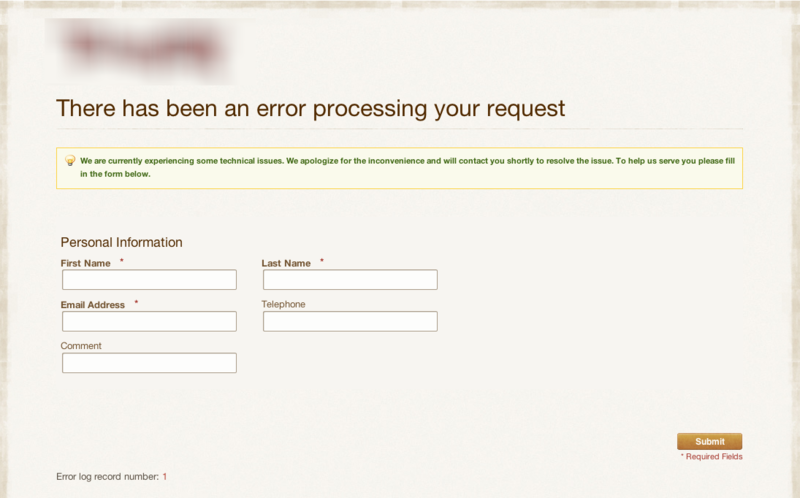 Error report page styled the way you want it to. NOTE: This is a part of an actual store we’re developing therefore the logo is blurred. This works a treat, thanks for this, I had been trying to work out how to do this myself for ages. @nilu – you can put this line in index.php after all includes! Thanks you so much, it works like a charm. @julian, @yget: you can add the exception in a phtml file that is called on all your pages. Also newbie and would like to know the same as Julian. Thanks a lot.. I was looking for the same thing. ..for to test the modifications of the local.xml. but that gives just a blank body (header and footer are still there). You know what, credit where its due, this post is great, the wampdeveloper one was great, there was also some other excellent ones recently, I am starting to look forward to whats coming next as your knowledge is extensive and your tips practical in the REAL world. Truly a most have to all Magento Stores, and seams easy to set up! This should be very useful – thanks. I’ll try it on a Magento store soon.